LONG POND, Pa. – Working with a substitute crew chief, and saving enough fuel to get to the finish line and complete a celebratory burnout, Kurt Busch won Monday’s rain-delayed Axalta “We Paint Winners” 400 at Pocono Raceway. 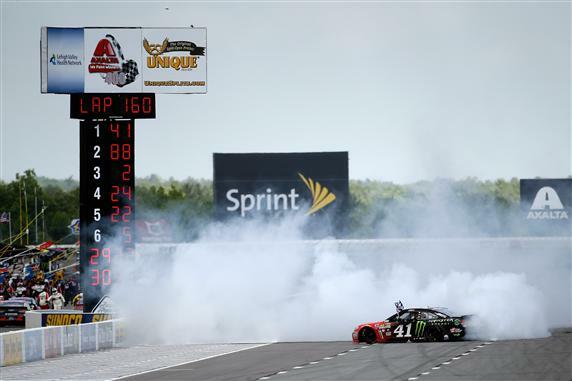 Busch won for the first time this year in the NASCAR Sprint Cup Series and for the third time at Pocono, a 2.5-mile speedway featuring three widely different corners. And Busch claimed his 28th victory in NASCAR’s premier series with race engineer John Klausmeier leading the team in place of crew chief Tony Gibson, who was serving a one-race suspension for a lug nut violation last week at Charlotte. Told he was two laps short at the start of the final 33-lap green-flag run, Busch saved enough fuel to get to the finish while keeping race runner-up Dale Earnhardt Jr. behind him. “We just had to balance everything,” said Busch, who got to the stripe 1.126 seconds ahead of Earnhardt. “We had a fast car, a (suspended) crew chief, and the way the fuel mileage played out, I didn’t know if we would have enough fuel. Busch, however, was taken aback when told how much fuel he had to save. “I was like, ‘Whoa, how many laps shy are we?’” Busch said. “They said two. These are really long straightaways at Pocono, and you have to manage saving fuel as well as maintaining lap time. So many thoughts can go through your head, but I just stuck with the checklist. Polesitter Brad Keseslowki ran third, followed by Chase Elliott and Joey Logano. Kasey Kahne, Matt Kenseth, Carl Edwards, Kevin Harvick and Ryan Blaney completed the top 10. A series of mistakes and divergent strategies scrambled the running order almost from the drop of the green flag. On Lap 23, under caution for Brian Scott’s spin in Turn 1, Keselowski was nabbed by NASCAR for unapproved body modifications when his jack man threw his shoulder into the right side of the No. 2 Ford during a pit stop. Keselowski had to serve a pass-through after the Lap 27 restart as part of the penalty for the infraction. Logano, who started on the front row beside his Team Penske teammate, got shuffled to the back by the front bumper of Ryan Newman’s Chevrolet. Taking umbrage at contact from Logano’s Ford on the frontstretch, Newman pounded a series of dents in the left rear of Logano’s car, knocking him up the track in Turn 1 as half the field passed him to the inside. Harvick was forced to pass cars – repeatedly – because of an early speeding penalty and a pair of inopportune cautions that occurred right before he was to make planned green-flag pit stops. Harvick, however, had plenty of muscle under the hood of his No. 4 Chevrolet and was able to fight his way back into contention with relative ease. Keselowski and Logano also recovered, but it took longer stints on track and a succession of three cautions between Lap 88 and Lap 102. By the time the field restarted on Lap 109, Logano, with the left rear of his car heavily taped, was fifth, and Keselowski had climbed to 10th. But three more quick cautions and an array of different strategies once again altered the complexion of the race. Ty Dillon stayed out under the ninth caution (called for brother Austin Dillon’s wreck) and led the field to green on Lap 123, trailed by Casey Mears, who took fuel only under the yellow. Moments after the restart, Jimmie Johnson, who had been running in the top five for most of the afternoon, spun in Turn 1 and clipped the inside wall, sending the No. 48 Chevrolet to the garage. When the field restarted on Lap 127, Earnhardt had the lead, trailed by Elliott, Mears, Busch and Keselowski. At that point, Harvick was 20th, having pitted under the ninth caution to top off with fuel with 39 laps left. As Elliott and Earnhardt battled for the top spot entering Turn 2, Busch surged past both cars, and that was the move that decided the race. Thirty-two laps later Busch was doing donuts on the frontstretch after taking the checkered flag.